Stay tuned tomorrow for a Fire in the Triad Highlights post. Included in the post will be unseen photos, recipes of popular Fire in the Triad dishes, and other tidbits from the Fire in the Triad Competition Dining Series. 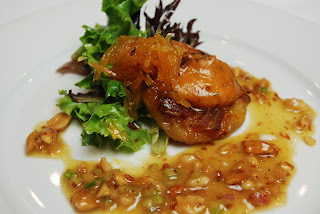 It's been a whirlwind of a time during the Got To Be NC Competition Dining Series. First, I want to issue words of thanks and gratitude: I feel so lucky and blessed that I was given the opportunity to cover each event and serve as Official Blogger for Fire in the Triad. 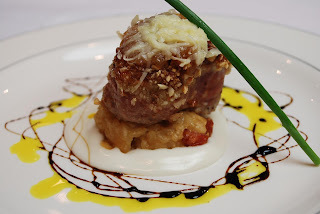 I've enjoyed serving as queen blogger and the time has come to crown a winner of the heated battle between two lauded chefs and their restaurants in the Piedmont Triad. 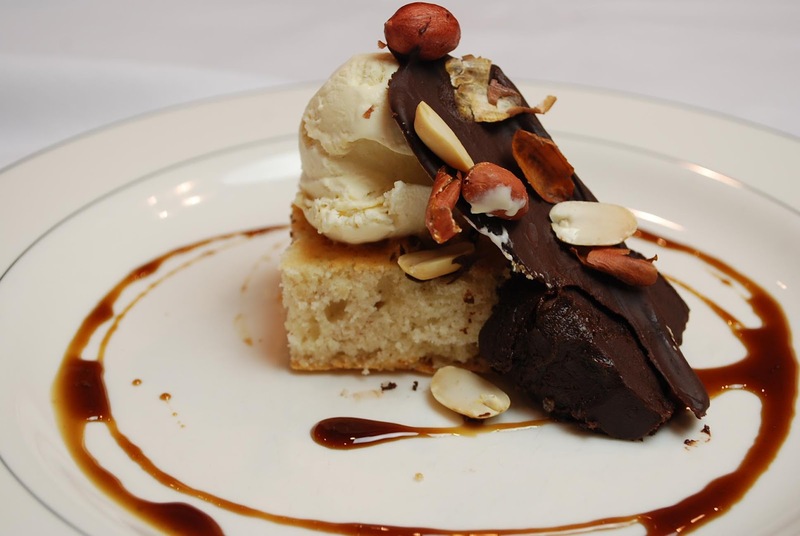 The Got to be NC Competition Dining series was started by Jimmy Crippen owner of Crippen’s Country Inn and Restaurant in Blowing Rock, NC as a way to build business during the off season, 7 years ago. In 2012, the competition has evolved into a series across the state promoting local North Carolina ingredients, chefs, local restaurants and people. From Blowing Rock with “Fire on the Rock,” to Wilmington with “Fire on the Dock,” to Raleigh with “Fire in the Triangle” and Greensboro with “Fire in the Triad, the best was saved for last as the first 44 Competition Dining Series dinners were held earlier in the year. If you plan to attend the series championships in Raleigh, I suggest you purchase tickets as SOON as they go on sale. Keep your eyes and mobile devices peeled to CompetitionDining.com as well as the Facebook page for information. Tickets will be sold within a matter of minutes, I'm sure. Tuesday night, it was the final showdown of Fire in the Triad between Chef George C Neal III of 1618 West (left) and Chef Michael Harkenreader (right) of Undercurrent, both of Greensboro. 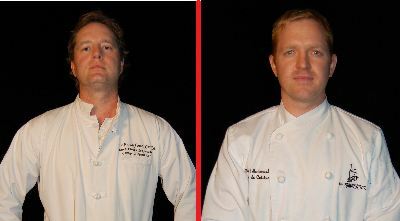 Both chefs knocked out 13 competitors for the chance to wear the coveted red chef's jacket, win $2,000 and are already wearing clogs they won in the semifinals from sponsor, Dansko. As the ingredient was revealed, everyone in the room cheered... except for me :( I am highly allergic to peanuts and I was scared. I thought I was going to have to high-tail it back to Winston-Salem and get a burger on the way home. Alas, I did not. The kitchen was notified and all of my plates were modified. This is a true testament to the competition and the chefs in the back-of-the-house. I didn't feel entitled to have special dishes, just for me, but I was glad I was able to enjoy each course. I did, however, have to leave the dining room to eat a few of the courses because the aroma of peanuts overwhelmed me, but I had an EpiPen on standby and a few Benedryl to help quell any reactions. No trip to Moses Cone was needed. Judges: Michael Hastings, food editor of the Winston-Salem Journal, Eliza Hudson, editor of Our State Magazine and John Batchelor, food critic for News & Record in Greensboro. I was also fortunate to sit at the party table last night! Let's get down to the business of getting down! A tart tatin is an upside-down tart, usually made with apples. I didn't have a tart but my plate was a mound of cheddar, pork, caramelized onions and a large amount of orange marmalade that covered everything. Holy cow! Or maybe I should say 'Holy Pig!' This course was my personal favorite. My portion had pulled pork or shredded short rib on top and I loved every bite. The hot curry oil and the risotto cake dipped in the coconut sauce made my heart sing. The sweet pork melted in my mouth... I left the dining room to eat this one in the lobby not because of the peanut aroma, but because I didn't want anyone to see me licking my fingers. 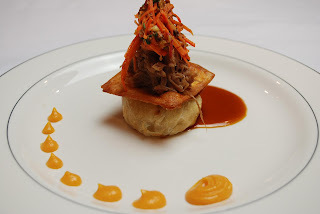 My modified plate was simply braised pork on top of the taco piece (fried puff pastry, I believe), savory and sweet BBQ sauce and the thick, sweet potato beurre blanc. My table's consensus was that there was a lot going on here and it was hard to detect all of the listed ingredients. This dish takes the cake for creativity. Osso buco means 'bone with a hole' and is usually a veal shank. A classic accompaniment is gremolata which is made with chopped parsley, lemon zest and garlic. THIS osso buco, however--this pork osso buco was a glorified ham hock. That's right folks. A ham hock. A pork shank wrapped in bacon (more pork) and in place of the hole where the bone would have been, a fried potato baton. BRILLIANT! This gremolata was mostly celery stalk and played up the bitterness of the mole and the apple-turnip puree. Look at those Redskin peanuts! This photo makes me long to eat them. People pointed and laughed at my modified plate. I have some key words to tell you right now: Ginger. Sea Salt. Chocolate. Ganache. Dark, chocolaty, salty, spicy, gingery--it melted on my spoon in my mouth. I wanted more of it. I loved it. I'm sure the peanut bark with the redskin peanuts was excellent (They remind me of my grandma, who would roast them in the oven), but that ganache... mmm mmm mmm. I can only attest to what I ate and my favorite part of this course was the cinnamon roll. It was soft, buttery, cinnamon-y and all mine. The chocolate bowl was good and the Porter ice cream was good as well, but the star was that cinnamon roll. When I grow up, I want to learn how to make rolls like this. After all of the electronic votes were in, it was time for the chefs and their crews to come out, make commentary about the night's competition, the competition as a whole, shake each others' hands and listen to Jimmy Crippen read the results and reveal the winner. Chef Neal now joins the ranks of three other North Carolina chefs who have lit the Fire of Competition Dining. The Fire in the Triad After Party took place at the 1618 Wine Lounge. A magnum of Veuve Clicquot was opened and enjoyed by everyone in the bar. The celebration continued into the wee hours of the morning. I dare George to show up at Bank of America with this bad boy. 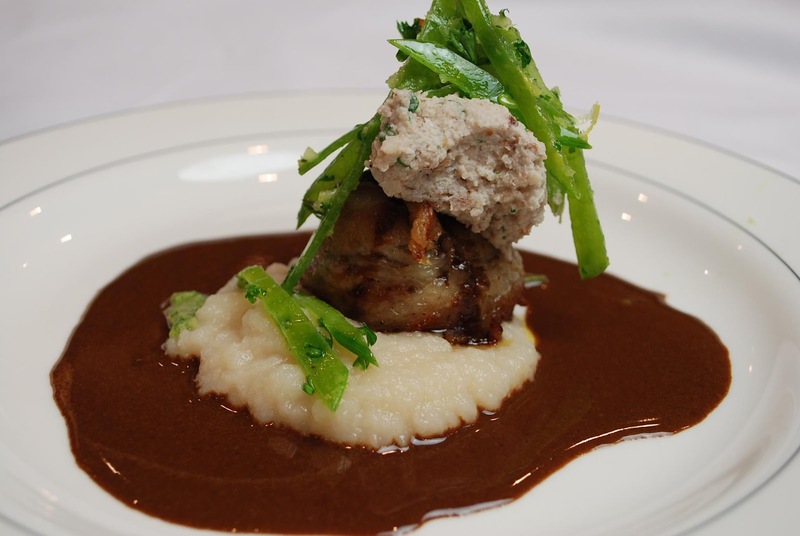 For more information about Competition Dining, the North Carolina Competition Dining Championship Series and any of the sponsors mentioned in this blog post or others, please visit Competition Dining.